Last Thursday was my birthday. I’m not into having a big fuss made, and I struggle with the idea of presents, which potentially means getting a heap more stuff that I don’t really need. The more I travel down this road of minimalism/low waste/sustainability, the more I struggle with it, which combines with the fact that as every year passes by, I have less and less need for new things. That being said, I am not at the point yet where I want to eschew all presents. I don’t really feel like I need presents to celebrate my birthday, yet there is something nice about acknowledging it – and I think people often feel that one needs the other. I pondered on requesting that nobody buys me anything – but it was only a couple of weeks before and would have been a little half-hearted. It is actually very difficult to ask to not receive presents, especially from family members, because they often feel like gift-giving is an important part of birthdays and other special and significant occasions. If people like to receive presents themselves, they seem to find it difficult to comprehend that others do not feel the same way. They think I’m being modest, or polite. My family have given me birthday presents every birthday for the last 31 years, so it might take time to adjust to a new way of thinking. Of course the effort is appreciated. It’s just that effort doesn’t need to equate to spending lots of money, or giving lots of presents. Fortunately, my family understand my feelings towards waste and sustainability (they must read the blog! ), and I have always had a ‘thing’ for useful presents, so I wasn’t bombarded with a load of inappropriate stuff. My boyfriend, who knows me too well and feels pretty much the same way about gifts as I do, got the perfect balance. He made me a card from an old work document and wrote a thoughtful message inside. He also bought – tickets! We love tickets. We don’t go to things super regularly and so he’ll often buy tickets as presents for birthdays, Christmas and other special occasions. It means we get to do something fun, spend quality time together and share new experiences. How perfect! 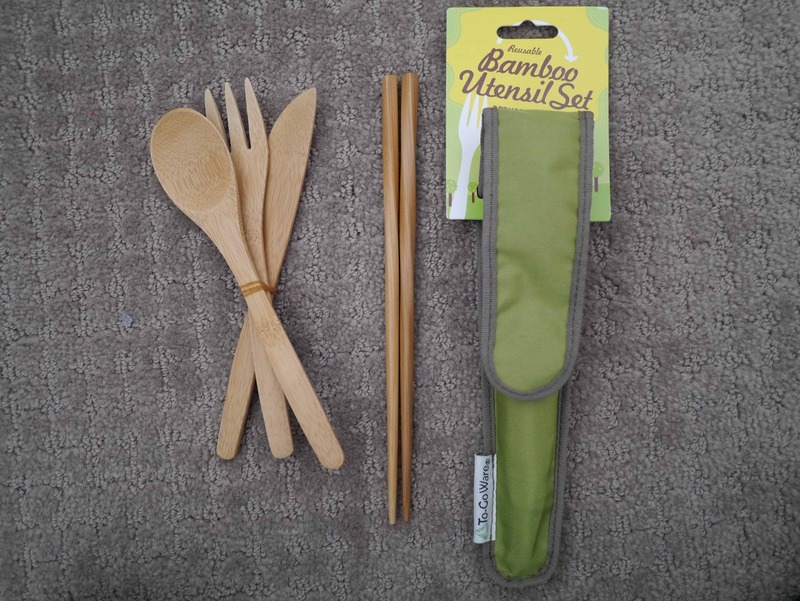 I also received one non ticket-related gift (not wrapped up to save on paper) – some portable bamboo cutlery! I have heard of this before, and it is something I will definitively use. There is a local Mexican place we sometimes go to that only has plastic disposable cutlery so I always take my own metal cutlery from home, but it’s quite heavy to carry around all the time. This set also contains chopsticks – something I do get caught out with occasionally. My boyfriend’s parents also went down the ‘experience-as-a-gift’ path and have given me some money for a cookery class or bicycling tour on a holiday that my boyfriend and I are taking in December. I love these kind of gifts as it means you have a memory that stays with you even after you’ve used the gift. The collapsible water bottle is a clever idea, particularly as the bag I carry round resembles a holdall half the time because of the various containers and things I lug about with me. I have a stainless steel water bottle which I use if I need to take water with me, but it’s heavy so I don’t often take it with me. I like the idea of not being caught out, and I think this will be especially useful for travelling, and on planes so I don’t have to use those stupid plastic cups. Hopefully (as the packaging claims) it will be super durable! The washable pads are something that was on my list of things to make once I learned to sew and own a sewing machine. I stopped buying those disposable cotton ones when I gave up plastic and haven’t been able to find a suitable alternative. Ta-da! 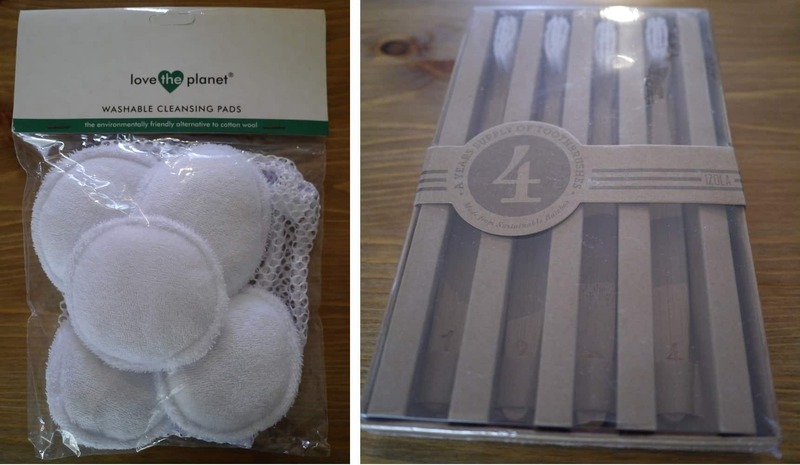 We already use bamboo toothbrushes so these are something we will definitely make use of. Shame both of these products came so overpackaged in plastic though, don’t you think? 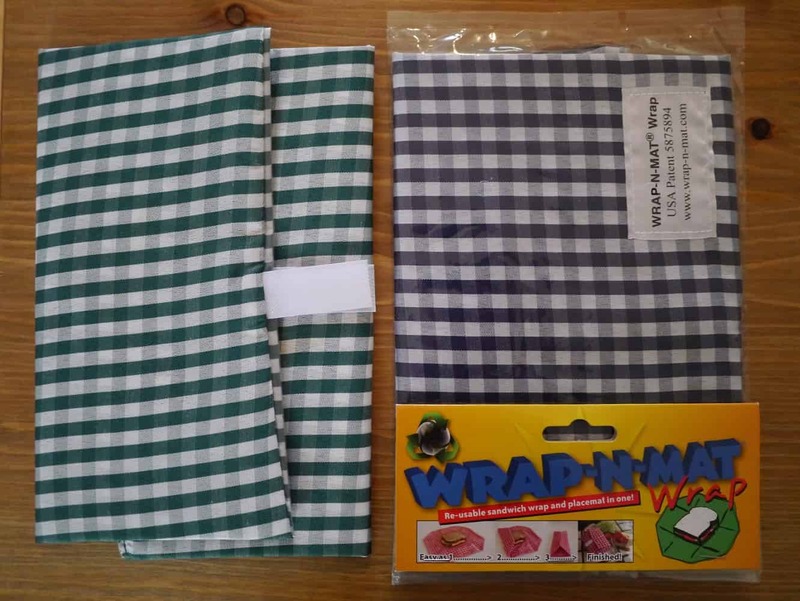 Food wraps are a great alternative to using clingfilm or foil to transport food. We don’t use either, but plastic containers are bulky and glass ones also weigh a ton. I’m pretty sure these will get a lot of use too. 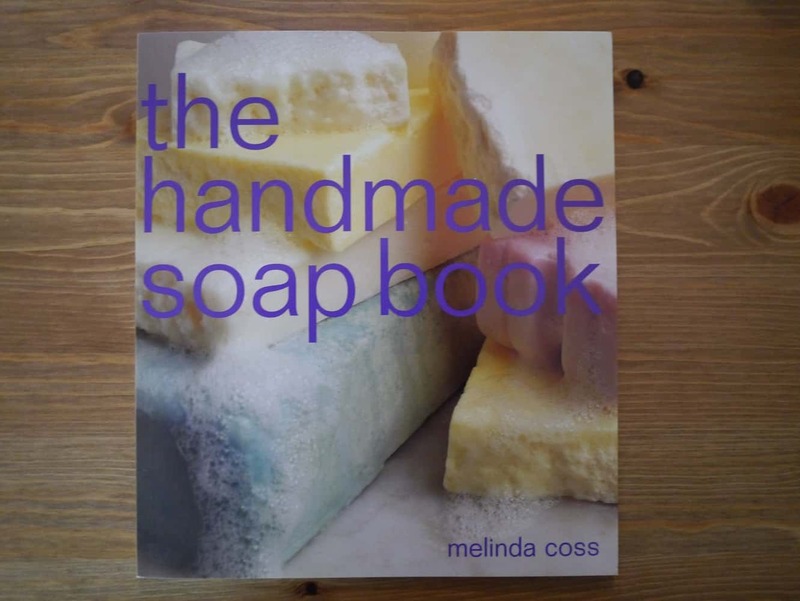 And a soap book! This has been on my list of things to learn how to do for ever, so I’m looking forward to spending some time reading this and getting all inspired. Of course, whilst I appreciate everything that I was given, the thing that meant the most was that my parents had flown across from the other side of the world and that I actually got to spend some quality time with them on my birthday. Far better than any gifts! Lastly, I wanted to share the card my sister sent. I asked her not to get me anything as she has donated a lot of her time to me recently for a project I’m working on, and I felt that that was more than enough. But she has found what is possibly the best eco-friendly card on the market. I had to share it, it’s so witty and I absolutely love it! The perfect card says as much as any gift! Awesome gifts! And Happy belated birthday! Some years ago we made the decision to stop giving and buying Christmas presents to reduce waste and ‘present miles’. In September, we wrote to everyone who might send a present and asked them not to, saying that if they wanted to do something, we would like them to make a donation to charity as we would be doing. Our preferred charity to support is Practical Action, but we said we were happy for people to donate to others. Now every year we make a large donation at Christmas. By breaking the present-giving cycle at Christmas it has also reduced present-giving for birthdays. I told relatives that they would receive presents randomly if we saw something they might like… and the favour has been reciprocated enthusiastically by my sister and her children, from whom we occasionally receive lovely appropriate gifts. A gift is so much more special when someone has bought something because they really think you will like it than simply because they feel obliged to because of a particular day of the year. Our plan for Christmas this year is to ask people not to give us gifts or money. We want to ask people properly – by that I mean formally I guess – rather than just saying “oh don’t bother, you don’t need to get us anything” etc etc which seems to fall on deaf ears. It will be interesting to see how it goes. I might share your story with them. I love the last line you wrote. So true. What great gifts and cards! I also struggle with receiving presents but find it hard to tell people not to buy me anything for all the reasons you mentioned. My brother and I decided “no gifts” to each other years ago, and each Christmas we collaborate on a charity donation. I get charitable donations as gifts from other family members now too. Birthday-wise: Now I’m thinking: isn’t it Tolkein’s Hobbits who GIVE presents on their birthdays? … hmm, that might be a good way for me to pass along some stuff… if I knew who might actually want it. PS, coming through the airport in New York City yesterday I noticed Delta has put up water-bottle-filling stations alongside drinking fountains, with a message about saving and reusing plastic bottles or bringing your own (like you do). I met someone recently who decided for her birthday to give presents – or rather donations – rather than accept presents. Very inspiring. I wasn’t at that point this year. I’m not sure you offloading your old stuff is quite the same though…?! The water fountain sounds fantastic! Let’s hope more airports catch on. There is a lot of green washing going on in this materialistic world. If you want to go natural use the toothbrush stick.